Let’s get one thing straight from the get go: All you craft brewers are awesome. The industry is exploding with innovative and exciting breweries selling more beer than ever before in more countries (American craft beer is international!) than ever before. Here at Craft Brewing Business (CBB) we tip our hats to craft brewers large and small — and even those future commercial craft brewers developing their skills in their homes. 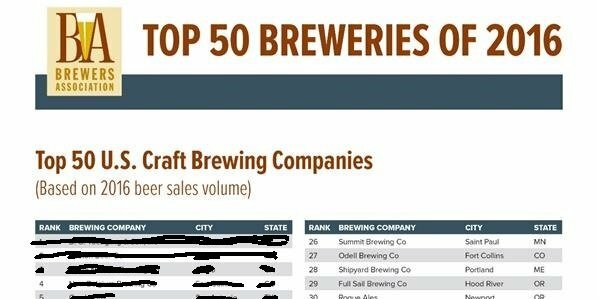 That said, let’s do the numbers: The Brewers Association released its annual lists of the top 50 craft and overall brewing companies in the United States, based on beer sales volume. Of the top 50 overall brewing companies, 42 were craft brewing companies. The full list is found in the link below. Before we get to that, let’s look back at the 2012 and 2013 numbers to see who has made the biggest moves in craft brewing production in the past year. Whoa, wait a minute! Who’s this young brewing whipper snapper that seemed to come out of nowhere this year and take the No. 1 spot?! Why that’s only the country’s oldest operating brewing company — D. G. Yuengling & Son — which was established in 1829 and is one of the largest breweries by volume in the country. You may recall that a little over a year ago the Brewers Association tweaked its definition of “craft beer” and recognized adjunct brewing as traditional. Welcome, Yuengling. For those of you still harping on the Craft vs. Crafty debate, you can take your debate over to this story. Welcome to the top 10, Minhas Craft Brewery! The Monroe, Wisc.-based brewery has a long brewing history (seriously, check out its extensive tale) and touts itself as a craft brewery that has been operating for more than a century. In 2006, after a long climb to the craft brewing top, the Minhas Family purchased 100 percent interest in, what was then called, the Monroe Brewery and renamed it Minhas Craft Brewery. For more background, check out the Minhas Craft Brewery website. Duvel Moortgat USA also crashes the top 15, coming in at No. 12. The middle of the list ebbs and flows, without much change, but big props to 21st Amendment Brewery which jumped from No.50 in 2013 to No. 41 in 2014. Click here to download the PDF of the Top 50 Breweries in 2014. Outside of that, it’s more of the same. Craft brewers continue to bolster barrelage to compete in this crowded field. And what a difference a definition makes. What do you think of this year’s rundown? Is craft beer better off with the new definition? Do we even need a definition any more or should the beer speak for itself? CBB says that we should all crack a beer and toast to all the excellent brewing done in the United States. But you can sound off in the comments below. Phil Platt liked this on Facebook. Rick Flak liked this on Facebook.